Yinchuan, the capital city of Ningxia Hui Autonomous region is where the great Mongol Emperor Ghengis Khan met his death around 1227. Located south of Inner Mongolia and west of Beijing, with the famous Helan Mountains dominate the local climate. 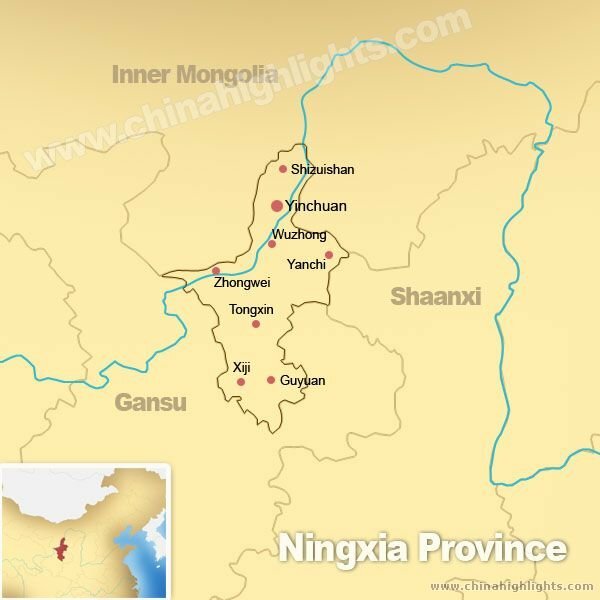 Today Ningxia’s population of around 6 million – small by China’s standards – includes 37% of the Muslim Hui ethnic group. Investment in vineyards and wine production is a new innovation and now drives the Ningxia economy. The focus on building large wineries with impressive tasting facilities, restaurants – the chateau concept- with onsite accommodation to the focus of Ningxia’s wine tourism and visitor experience. Currently in Ningxia there are around 40,000 hectares planted in vines (more than all of New Zealand!). The fascinating aspect of Ningxia's viticulture is that because the bitter, cold winds blow south and the temperature can drop to -25C, the grape vines are buried under a pile of soil from late November until the beginning of spring. Burying the vines is the biggest challenge for wineries as it is costly and there is always a risk that vine will be killed by the process. You can see the trench from which soil is dug out and used to cover the vine trunks and cordons over the cold winter months. This photo is of shiraz grapes that will be harvested the following week at Ho-Lan Soul Estate.While they dig up the soil near the vines with machines, it takes 2-3 weeks to cover vines by hand. This visit to Ningxia was hosted by the Ningxia Wine Board and brought 24 international sommeliers to compete in eight groups at a gala event at the International Wine Expo of Helan Mountains's East Foothill. Included in the invitation were presidents and chairman of guest sommelier associations. The event was organised by Tommy Lam and countries represented included: Czech Republic, Malaysia, Austria, USA, Mexico, Indonesia, Hungary, Chile, South Korea, Taiwan, Georgia, Singapore, Russia, Peru, Australia, New Zealand, Colombia, Italy, Belgium, Canada, Norway, Philippines, Thailand and China. In addition, there was the final of the China Group Junior Sommelier Competition with over 69 teams competing for top honours. Visits to vineyards and wine tasting were also part of the six day programme. Jing Zhang is the co-founder and winemaker of Helan Qingxue vineyard which produces the Jia Bei Lan加贝兰 range of wines. LI Demei / 李德美, the highly regarded professor of oenology at the Beijing Agricultural University was consultant to the establishment of Helan Qingxue and Zhang Jing asked to be his apprentice. In 2011, Helan Qingxue shot to fame when it was was awarded a Decanter World Wine Awards trophy which put Ningxia wines on the international map and sparked enormous curiosity in this region. 2011 Decanter World Wine Award International Trophy with the cask signed by Jancis Robinson MW. This sits the barrel hall of Helan Qingxue. Cabernet Sauvignon grapes waiting to be harvested at Helan Qingxue. At Ho Lan Soul, we met the owner Mr Chen Qi and learnt of his impressive plans to develop of 7777 hectares of land into an organic vineyard, village and property development. Inside the Ho-Lan Soul barrel hall with popular Welsh Riesling wine and award wining Shiraz. Ho-Lan Soul owner, Mr Chen explains his vision to develop 30 different wineries specialising in one grape variety only. Each winery will have its own tasting room and accommodation. There are currently opportunities to invest. The grape Marselan is a crossing of Cabernet Sauvignon and Grenache developed in the 1960s. It has skins with a dark colour but soft tannins. It is late to ripen and resistant to many vineyard diseases.